PermaRoute is a self-adhesive facility marking system, designed to optimise a facility or warehouse to increase efficiency and safety allowing for maximum productivity and reducing the likelihood of any risks of accident or injury for staff and visitors. Applying PermaRoute requires minimal downtime and many areas can still be used while it’s being applied as long as the application surface is clean and dry. Once applied PermaRoute can be used almost immediately and the adhesive will achieve a full bond after 24 hours. The industrial-grade PVC material is durable enough for all but the most demanding environments. Recently the to the extensive 5S colour range has been increased with a new variant…. Black and white. The black & white hazard finish helps to designate areas which are required to be kept clear at all times for operation purposes. If areas such as these become congested, this could cause serious productivity issues or even more serious, safety issues. It is important that areas that need to be kept clear at all times are so to prevent work backlogs and risks to guests or employees health should an accident occur. 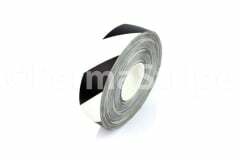 Black & white PermaRoute is available in various roll widths ranging from 19mm to 1168mm in lengths up to 30 metres. Die cuts are also available in a wide range of people shapes and joins to help you create an effective facility marking system. Custom options are also available should you have a particular requirement and these can be discussed dependent on order quantity. Should you wish to see the product first hand you can order samples via the intuitive sample request form. If you would like to enquire further you can do so by contacting the sales team via phone, live chat or alternatively fill out the contact us form and a member of the sales team will get back to you as soon as possible.